In my previous post, I mentioned several mentors I’ve had. Each of my mentors has made significant contributions to strengthen my writing. But, someone asked, how do you find a mentor? It’s a good question. 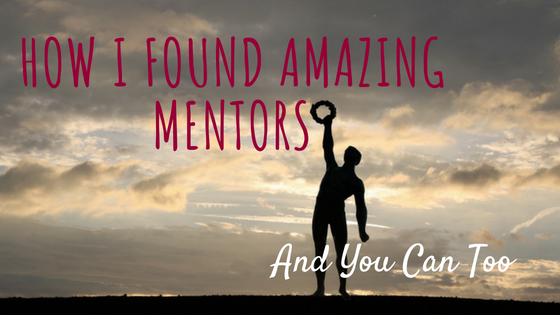 This is how I found amazing mentors and you can too. The first step in finding a mentor is assessing your own strengths and weaknesses. Are you solid with dialog but need help creating compelling characters? Do you have a weakness for long passages of description or backstory that slow your story’s pace? Are you great at beginnings but get bogged down in the middle? Be honest with yourself. Identify what you know and what you don’t know. If you don’t know how to even start, then you need to hit the books. Start learning the basics. That was where I started–with a correspondence course that taught me basic storytelling. It can be difficult to believe in yourself when you face the computer or the blank piece of paper. And your can-do attitude will take you a long way. Believe in yourself, in your ability to find the answers you need, and in your desire and ability to learn and do. It can be a long, slow slog but each day you practice, you’re building the skills to shape the stories you want to tell. Believe that. It’s not always easy. I struggled with wanting to write but being afraid to prioritize it over family, friends, and the day job. But I wanted it bad enough that I invested money in supplies, an equipment, tons of books, expensive classes, and hours and days and weeks and months and years. Once you’ve identified how much you want to learn and what weaknesses you have, you know what type of help you need. Now search for books, workshops, conferences, classes, Facebook groups, meet-ups. In-person or online or in print are choices you’ll make based on what you need to learn, what’s available in your area, and your preferred method of learning. Join at least one group that is supportive, nurturing, and able to give you honest feedback. How do you know when you’ve found that group? You can get referrals, read reviews, or observe a meeting or class. You’re going to have to trust your gut. If the initial sting of criticism fades and you realize that the criticism had some merit, then you’re in the right place. If the criticism is personalized, demeaning, or meaningless, then walk away and look somewhere else. I visited a number of writers’ groups. I’d attend one or two meetings, decide that group wasn’t for me and moved on. When I found the ones that worked for me, I stayed as long as it continued working for me. And by working for me I mean I learned things, I was encouraged, it kept me producing writing, I mentored others, and I had fun. You’ve found a group or class or book. Work hard. Show your best professional work ethic and attitude. Take criticism without taking it personally (easier said than done) and learn from it. Read how-to books, read books in your genre and study how it’s others have made it happen. Practice. How? Copy the text from a writer you admire and as you type it word by word, look to see how the author made the magic happen. Do whatever it takes for you to learn what you need to know. According to Merriam-Webster, a mentor is a trusted counselor or guide, a coach. But there’s more to it than that. A great mentor cares about helping you be the best you can be. Mentors are inspiring. Some mentors can have resources and tools you wouldn’t know to or be able to access without their help. Mentors sometimes give you the push that you need. Mentors share. They aren’t threatened by your successes, they take joy in them. Your mentor can be a long-dead author. Or in one of your classes, your workshops, or your Facebook groups you’ll find someone who knows a little more than you do about some part of story writing. That person may never say, I’ll mentor you, but you can still use that person as a guide and learn from him or her. Keep striving to write the best that you can and learn from each thing you write. You may meet someone whom you deeply admire. You’ve demonstrated a willingness to learn, an “I’ll keep trying” attitude, and you write in the same or a similar genre. If you’re bold enough you can ask for that mentorship. He or she might agree. If you’re not bold enough, observe that person. You’ll still learn a lot. And if your request is turned down, don’t take it personally. Sometimes it really is that the person has a full plate and cannot do one more thing. Keep working, keep looking. Maybe your next mentor is in a book. Or maybe it’s been your best friend all along. Over time your strengths and weaknesses will change. Strengths you have now may be the weaker skill after you’ve strengthened others. That’s okay. You’ve demonstrated you have the desire and the ability to learn. And you will. You’ll have different mentors over the course of your career. Some you may have only for a few hours or a few days. Others you may have for years. If you’re lucky, you’ll grow to be a peer of your mentor and share a different relationship. Madeline L’Engle mentored me in one two hour afternoon session. She critiqued a manuscript of mine. Her kind and warm comments gave me hope that carried me through darker days. If you find the process of the writing and the learning and the rewriting you’ve followed the right path. That’s the real reward. Five-star reviews are good for the soul. And fans are a blessing and fun and amazing. But at the end of the day, it’s just you and your input device (computer, typewriter, pen, and paper). And if that means as much to you as it does to me, you’ve found your reward. I hope you found what you needed in this post. If you still have questions or you have suggestions or comments, please share them below.